The department of Charente offers a wealth and diversity of landscape beauty, an ancient cultural heritage, world renowned products, and a close proximity, but peaceful alternative, to the bustling Atlantic coast. The Charente River meanders through 360km of enchanting countryside, past rolling vineyards, ancient water mills, beside glorious Romanesque churches and through picturesque sleepy villages until it reaches the Atlantic Ocean at Fouras. It is the most important river of the region and both Angoulême and Cognac were built on its banks. With its relaxed pace of development and stable population of around 350,000, the department of Charente has become the fourth favourite for British people buying property in France. Situated in South Western France, Charente is one of the four departments of the Poitou Charente Region. The capital, Poitiers, is known partly for the Futuroscope Theme Park. With Charente-Maritime, Deux-Sèvres and Vienne, the Poitou Charente region lies partly in the Aquitaine Basin while to the north east is the dramatic landscape of the Massif Central. Charente property ranges from elegant town houses and villas in Cognac and Angoulême, to traditional Charentais farm houses and whitewashed stone villas. Historic manors and chateaux can be found in the villages and dotting the countryside – Charente is an area with good access to the coast but without the premium demanded for coastal property. In 2011, average Charente property prices were very good value and well below the national average of €2980 per m2 (FNAIM 2011, Notaires de France 2011) making this area very popular. With excellent road, rail and air transport links, the area has become a haven for property seekers from the UK and Europe wishing to relocate, purchase second homes or rental properties that generate a steady income. The climate is second only to the Riviera; Charente property owners enjoy over 2000 hours of sunshine per year with early springs, summers tempered by the Atlantic breezes and mild winters. 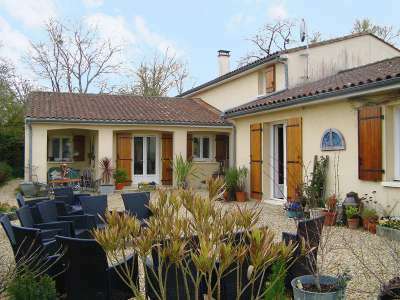 Charente property owners have the best of the wonderful French way of life. Angoulême is the largest conurbation with a population of 100,000 and is a city of two halves. The hill top ancient town looks down upon the vibrant, modern commercial sector, so it has something for everyone especially during the summer festival season. 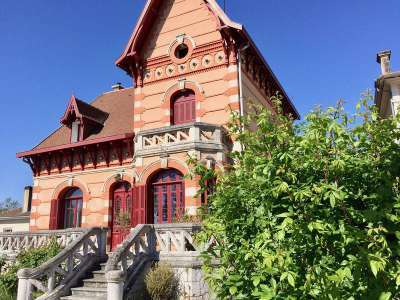 The monumental wall paintings drawn by famous comic strip artists, and the Comic Strip museum, one of five museums in the city, are a must see for Charente property owners and visitors alike. Cognac is the second largest town where the famous drink dominates activity. Other popular towns and villages for Charente property include Jarnac, La Couronne, Ruffec and Confolens which has excellent examples of half-timbered houses. Aubeterre-sur-Dronne, classified as one of the most beautiful villages in France, with its amphitheatre and terraced gardens stands on a limestone cliff. Charente is home to ancient villages and historic buildings including the Abbey of Saint-Savin, a UNESCO World Heritage Site. Charente originally earned its wealth from salt and then Cognac. Until the 20th Century the river provided transport links with coastal shipping routes and from the 18th century paper products also became an increasingly important contributor to the economy, creating a population peak in 1851. In 1872 the disease Phylloxera devastated the Charantais wine industry and this, and the wars of the 20th century, caused a decline leaving much of the area undeveloped. Today Cognac is still the most important industry with 95% produced for the export market. The regional aperitif Pineau is also produced locally from fermented grape must and Cognac eau-de-vie, but just for local consumers. The river Charente is still navigable for 171km from Angoulême to Rochfort and there is fishing both here and in the exquisite Marais Poitevin marshland nature reserve where visitors can enjoy flora, fauna and over 64 species of birds from a glass bottomed boat. There is over 100km of cycle routes from which to enjoy the diversity of the local area. The area also boasts five golf courses including the international standard Golf Club de la Prèze. Angoulême has its own airport, but Charente property owners can also fly to Poitiers, Limoges, Bordeaux and La Rochelle, all of which operate excellent low cost flights to the UK and other parts of Europe. For rail users, the TGV runs from Lille direct to Angoulême in just 4 hours. Angoulême to Paris by car is 5 hours. The Charente area offers a wealth of features for the discerning property purchaser; beautiful landscape, a wonderful climate, picturesque villages, ancient heritage, and accessibility to the cities and the coast.